I’m excited to announce that a big, bold new line of Last Kiss merchandise is launching in Scandinavia. And—to make it even more exciting—it’s all because of a TV show that just aired. Businessman Tero Tahtonen went on the Finnish version of the “Shark Tank” TV show (“Leijonan luola” or Dragon’s Den) and wowed one of the venture capitalists on the show. 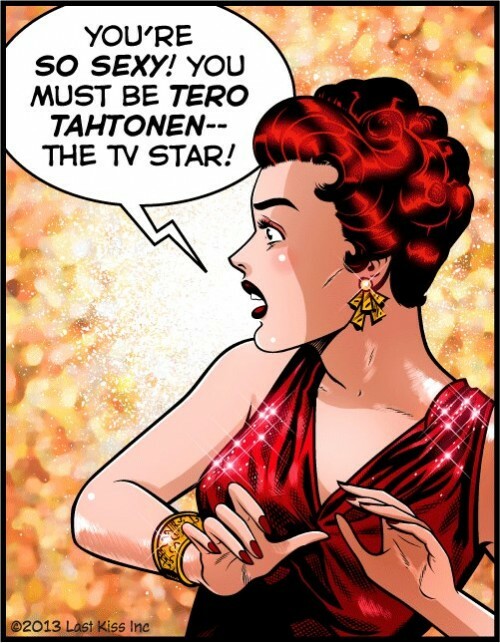 Tero’s idea was to create a line of gift items featuring comic book-style images. Anne Berner—a famous Finnish businesswoman—offered to partner with Tero. And eventually Tero and Anne selected Last Kiss for their first property. Tero’s TV episode aired April 10, 2013 and his new company, Pop Art Funnies Finland (PAFF), just launched its new website and Facebook page. Last Kiss fridge magnets (and a whole lot more) are in production right now. A golden opportunity for Mike Pascale to apply some country-specific sauna costumes to the art! We’ll need to find out what all the Finnish holidays are! Those should make some interesting fridge magnets, Tero!